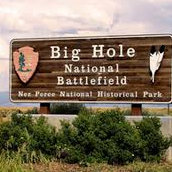 Big Hole National Battlefield is a memorial to the people who fought and died here on August 9 and 10, 1877; combatants in a five-month conflict that came to be called the Nez Perce War of 1877. Like other Indian Wars in the late 1800s, the Nez Perce War involved two very different groups with very different outlooks on land rights, civilian authority, government powers, social organization, and the responsibilities of the individuals to society. 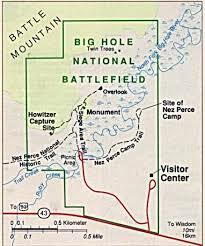 In 1992, legislation incorporated Big Hole National Battlefield with Nez Perce National Historical Park, making it part of a unique park consisting of 38 different sites located in five states; Oregon, Washington, Idaho, Montana, and Wyoming. Two Visitor Centers service the park, one at Spalding, Idaho, 11 miles east of Lewiston, and the other at Big Hole National Battlefield, 10 miles west of Wisdom, Montana. Both facilities are staffed year round by uniformed personnel who can answer your questions about the local area, the Nez Perce People and the War of 1877. Movies, museum exhibits, and guided tours are available at both facilities covering a variety of topics on the Nez Perce Culture and History. Although there is no Visitor Center at Bear Paw Battlefield located in Chinook, Montana, there is a nice display and video on the battle at the Blaine County Museum in Chinook. The Visitor Center houses a small museum with exhibits of Nez Perce, military clothing and equipment, a 12-minute introductory video presentation, books sales, area information, and a Junior Ranger activity program for first through eighth grade. A minimum of four hours is recommended to view the museum exhibits, watch the introductory film and walk the battlefield trails. Fishing (state license required), photography and wildlife watching (moose, elk, raptors) are additional recreational opportunities that are available within the park. All are welcome to take a self-guided walk through the battlefield from sunrise to sunset, daily. Guided walks are offered during the summer months. The road to the battlefield is closed in late autumn due to snow. The Visitor Center remains open daily, and the battlefield is accessible to skiers or snowshoers. The road normally reopens in late April, but the exact date of reopening is weather dependent. 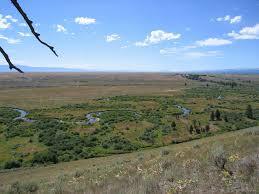 The Nez Perce Camp Trail leads 1.2 miles round trip, to the site where the Nez Perce were camped and attacked by United State Army soldiers and civilian volunteers on the night of August 9, 1887. The Siege Trail leads 1-mile round trip, to the area where the soldiers and volunteers were held under siege by Nez Perce warriors. Regularly scheduled ranger-guided tours are available daily in the summer. Educational programs for schools are given throughout the school year. Other groups are welcome and will be accommodated as staffing permits. 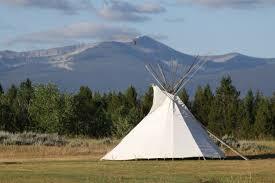 Reservations for school programs and other group tours required. Nez Perce, Military, and Volunteer descendants come to the battlefield to commemorate all those who fought here each year in early August. Call for dates and event listings at 689-3155. Open Daily Summer: 8:30 a.m. to 6:00 p.m.; Winter: 9:00 a.m. to 5:00 p.m. Closed: Thanksgiving, Christmas, and New Years Day. Reprinted from National Park Service brochure.